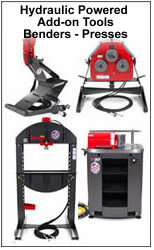 Unique Elite 110/65 Edwards Ironworker includes two work station, which can used simultaniously. This advanced feature rich ironworker has a ** Hydraulic Power pack built in to power the variety of Edwards Ironworker hydraulic accessories. 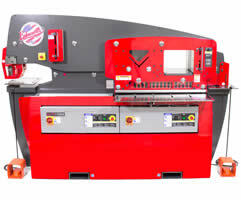 Standard tolling includes a 110 ton Punch, a 14″ wide flat bar shear, an angle shear capable of cutting a 5 x 5 x 3/8 inch angle plus a coper notcher. Powerful and efficient, this dual operator Elite 110/65 Ton Edwards Ironworker can power 2 tools simultaneously so 2 people can be working in it at the same time. The Edwards 110 + 65 Ton Ironworker “Dual Station” includes the Hydraulic Power Accessory Pack and it will power additional accessory tooling like the pipe bender, new radius roller, shop press & more, so even more can get done in your shop. 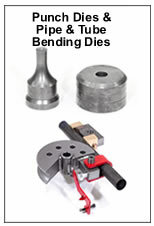 Pedestal Die Table Punch is standard allows for the punching of flange or web surfaces of 2" x 2" steel angle, channel and beam. 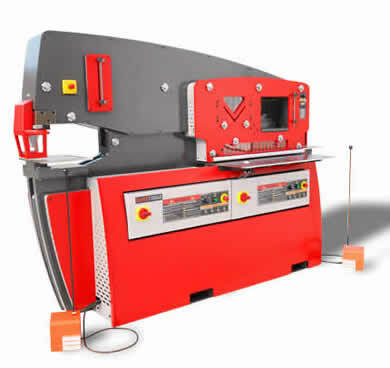 The punch has the power to punch a 1-3/8 inch hole is up to 1 inch steel plate. 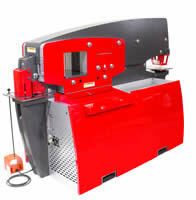 Angle Shear ( 5" x 5" up to 1/4 inch thick) cuts both thin and thick steel angle.